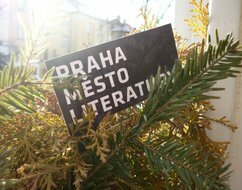 Over 30 thousand tickets with the Prague City of Literature logo were circulated around Prague in early 2012. On the upper side there was a logo of the project, on the back side it was possible to write down an extract from a favorite book. People could leave it in some unusual or interesting place. Blank tickets were available from the project partners.